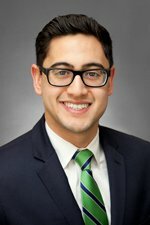 Arsalan Nayani focuses his practice on government law and medical defense litigation. He assists in matters representing individuals and corporations that are the subject of criminal investigations and criminal charges. Mr. Nayani's school law experience includes assisting with issues related to student discipline, student rights, and labor and employment laws. He also has experience in prosecuting and defending claims for breach of contract, tortious interference, product liability, fraud, violations consumer protection statutes, civil rights, and property taxation appeals. He is involved with all phases of litigation in federal and state law matters. He has also briefed and argued in the U.S. Court of Appeal for the Seventh Circuit. Mr. Nayani joined Hinshaw & Culbertson LLP as an associate in October 2015. Previously he was a law clerk with the firm, and a summer associate in 2014. Prior to his legal career, Mr. Nayani worked in the accounting and financial services fields. He has taken the four required examinations to become a certified public accountant. During law school Mr. Nayani gained trial experience under the supervision of the Office of the State Appellate Defender as part of the DePaul Legal Clinic. Mr. Nayani speaks Spanish fluently.